My grandfather William George Growdon died 60 years ago, and today we visited his grave in Stellawood Cemetery, Durban for the first time in more than 30 years. 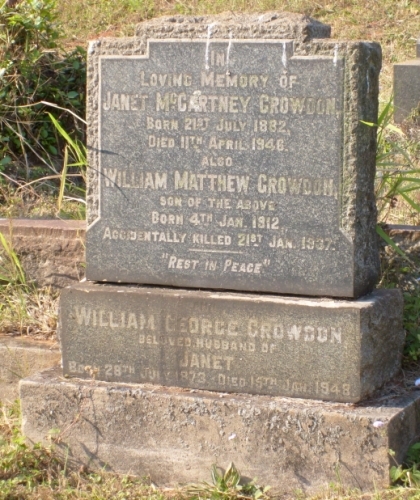 My grandmother, Janet McCartney Growdon, born Hannan, had died two years earlier, and they were buried in the same grave as my Uncle Willie, whom I never met, who was killed in a motorbike accident before I was born. William George Growdon (known as George) was born in Cornwall and came to the Cape Colony at the age of 3, where his father William Matthew Growdon worked on the Cape Government Railways as a platelayer in the Eastern Cape. George became an engine driver on the railways, until he was injured in an accident at Drummond, Natal, after which he worked in the railway stores at Greyville. Janet McCartney Hannan was born in Glasgow, Scotland, and met George Growdon in Transvaal, and they were married at Waterval Boven in 1909. Their grave is very near the highest point of Stellawood cemetery, and it seems that the dead have one of the best views in Durban. We arrived in Durban last Thursday, and spent yesterday morning in the archives seeing what we can find. We managed to find something about the Bataille family (related on the Hickman/Beningfield side through the Wilson-Yelverton family). Also found some references to Edwin Terrance Cathcart Cunnison and John Anderson Cathcart Cunnison. Val’s great-aunt Lil Decker married first Eugene Waldemar Rasmussen (we’ve recently made contact with people from that side of the family) then John Anderson Cunnison and then Frederick John Cathcart (both of whom seem to have vanished without a trace). Then we found this John Anderson Cathcart Cunnison, who sounds as though he ought to have been related, but he claimed to have been born in Canada, and we weren’t aware of any of that branch of the family who lived there. We visited Arthur and Dorothy Benjamin (nee Terblanche) in Northdene, whose son Todd and wife Pamela are emigrating to Australia tomorrow. Arthur is keen on family history, and is trying to trace his ancestors in St Helena. On Friday 22 August we left the very comfortable Alberfeldy B&B in Pietermaritzburg and drove down to Margate via Richmond, Ixopo and Harding — all of which are now bypassed by the main road. It was a rather dull day, smoky rather than overcast, and visibility was poor. The only town we passed through was Umzimkulu, which has grown tremendously. It used to have a couple of shops, a garage and a hotel. Now it has several shopping malls, and most of the big supermarket chains are established there, and it was crowded with Saturday shoppers. We stopped at a new garage which had a Steers franchise — their chips are the best of those from such places, as they are made with fresh potatoes, and not frozen. It was interesting to see that the garage had been opened by King Goodwill Zwelithini. Umzimkulu used to be in the Eastern Cape, but now it is in KZN. We’re staying in a rather posh holiday flat. A friend of a colleague of Val’s won a week’s stay in a competition, couldn’t use it, so gave it to us. It’s quite interesting as an exercise in sociology. It has a very fancy TV with quadrasonic sound and all, air conditioners in all three bedrooms (not that we have much use for them at this time of year, it’s quite chilly), but no reading lamps. On Saturday Val’s sister Elaine came down from Pinetown to spend the weekend, and we went for walks on the beach, and riding in a paddleboat on the lagoon, taking pictures of birds and the flat we’re staying in and developments on the waterfront. The South Coast has changed tremendously in the last few years, though at least the blocks of flats are not as ugly as they are further up the coast nearer Durban, where 15-20 storey rectangular blocks not only block out the sea view for anyone living inland, but are eyesores in their own right. At least the developments down here are more architecturally varied, but are clearly designed for the very rich. One block we passed on our walk to the beach, Colonial Sands, was advertising flats for sale, priced from R 1,9 million. On Wednesday evening we went to see the play Cabaret at the Hexagon theatre at the University of KwaZulu-Natal (see review in previous entry). It was very good, set in the declining years of the Weimar Republic in Germany, when the Nazis were growing stronger, and the atmosphere of menace was conveyed very well, as well as the way people retreated into vacuous entertainment in order to avoid having to confront it. Yesterday we went back to the archives about 9:30, and only ordered a few items, where we knew we would get more information. We found a few more descendants on the Greenaway side — girls who had married a Crawley and a Klusener (but the famous cricketer Lance Klusener doesn’t seem to be related). We also found more information on the Davis family (related on the Cottam side), and the Beningfield, Raw and Hickman families. 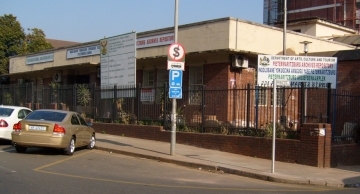 Then went to the Masters office, parking in Burger Street. It was very different to what it had been when we had been before. They were registering estates at a table outside on the verandah and seemed much busier than in previous years. Also, they did not have more of the files we were looking for, which are apparently now stored in Pinetown, and have to be ordered a couple of days in advance, and as we were leaving tomorrow. It had previously been a rather sleepy place, frequented mainly by lawyers clerks. There was one there, ernestly evangelising another bloke who had come in and asking him if he knew what would happen if he died. We looked only at the estate of Moira Bessie Winship, and one of the staff watched me while I did it — perhaps they’ve had problems in the past with people nicking stuff from the files. There were pamphlets explaining the work of the Masters office in Zulu, and so it seems that they have greatly expanded their clientele. In the past most of the deaths reported there were of whites and relatively rich Indians and blacks, so they are probably handling much more work than they did previously. It will probably increase even more in the future, as people discover the advantage of using the Masters Office to avoid inheritance disputes. is now, but they were better at covering it up, because they weren’t hampered by a free press. Today we leave Pietermaritzburg and we are going on to Margate for a week. One of Val’s colleagues at work won a week as a prize in a competition, but could not use it, so gave it to us. Cabaret was immortalised in 1972 by the film version directed by Bob Fosse. It won eight Oscars that year, two of which went to Liza Minnelli and Joel Grey for their portrayals of Sally Bowles and the Emcee, respectively. Inevitably, any subsequent production is compared to the film, as the roles of the Emcee and Sally Bowles have to bear comparison with the iconic performances of Minnelli and Grey. Based on the world described by Christopher Isherwood in his Berlin Stories, the milieu is the Weimar Republic, under a government that encouraged sexual indulgence of all kinds. Aitchison is very good as Bradshaw as are Diana Wilson as Frau Schneider and Leo Quayle as Herr Schultz. Second cousin once removed James Aitchison (from the Growdon side of the family) acts in a Pietermaritzburg play. On Saturday 16th August Val and I drove down to Pietermaritzburg, through Delmas, Standerton, Volksrust and Ladysmith (thus, among other things, avoiding the toll roads). We had breakfast in Delmas and lunch in Ladysmith. The road from Delmas to Leandra (which I still think of as Leslie) has recently been resurfaced, and the road between Leandra and Standerton has ruts and potholes. The poor condition of the roads is a result of privatisation. When the roads were built, they weren’t designed with today’s 26 and 32-wheelers in mind. Most of the heavy goods went by rail, and in fact most of the heavy trucks we saw were carrying containers, which could just as easily go by rail between the main centres, and be distributed from there by trucks. But deregulation has meant that a lot more of the heavy stuff goes by road, so for the first time the sight of a raised middelmannetjie is becoming quite common in tarred roads. 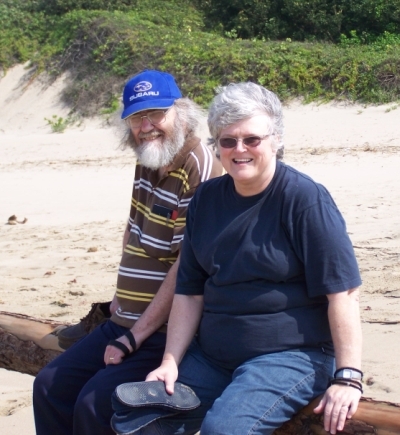 We arrived in Pietermaritzburg in mid-afternoon, and went to see John and Jenny Aitchison. Except that my cousin Jenny Aitchison (nee Growdon) was in the UK, visiting her newest granddaughter. So John was there, and their youngest son James with his wife Eloise. James and Eloise are taking part in a play Cabaret, which got a good review in the local paper, the Natal Witness. 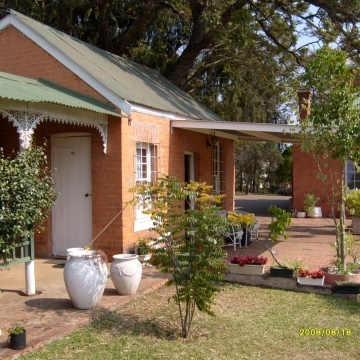 We are staying at the Aberfeldy bed and breakfast in Scottsville, which is in a traditional Victorian pink-brick house, with very comfortable cottages in the ground, also built in the Victorian style. We stayed here once before a few years ago and enjoyed it, and now it is under new management of Phyll and Ron Geyser, it is still very comfortable and convenient. The cottage we are staying in thas a bedroom and a sitting room, so when I wake up at 3:00 am, as I often do, I can work in the computer or read without disturbing Val. Unfortunately we discovered that I had left the AC cord for my laptop behind at home when we were packing, so I wasn’t able to do any work on the computer. 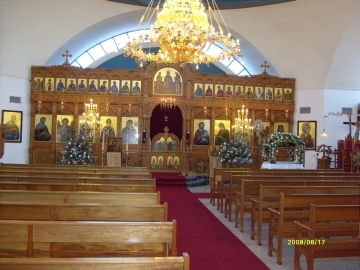 On Sunday we went to church in the new St Nicholas Church in Durban North, where I served with Fr Chrysostom and Deacon Raphael Hawkes. Afterwards we visited shopping centres to see if we could get a spare AC power supply for the computer, without finding any. On Monday morning we went to the archives to do some family history research. The archives buildings are being renovated, so the hours have been shortened, and there is also a limit on the number of items one can look at in a day, as the reading room is crowded into a tiny back room, and the records themselves are being moved from place to place ahead of the builders. Every now and then there is the sound of drilling, and the smell of wet cement is all pervasive. It seems we picked the wrong time to do our research. We’ve made no astounding discoveries so far, but have managed to confirm quite a few items of information, and been able to add some names of spouses and children, and dates and places of birth for some family members. In the evening we went out to dinner with John Aitchison to have more time to chat and catch up on news of family and friends. In addition to being married to my cousin, John is one of my oldest friends, as we werer students together in Pietermaritzburg more than 40 years ago. We’re considering a joint project of analysing South African security police surveillance of opponents of the apartheid regime in the 1960s. We have both got copies of the reports they sent about us to the Department of Justice, which are quite revealing of the mentality of the apparatchiks of the regime at the time. Back then we could only speculate on their motives and their mental processes, but now the evidence is available, so it is perhaps worth recording. We spent more time in the archives this morning (Tuesday), and then at last managed to get a spare AC cord for the computer, so I was able to write this blog update. Tomorrow Val and I will leave for a holiday in KwaZulu-Natal. We hope to spend a week in Pietermaritzburg, where we will visit friends and family, and hope to do some family history research in the archives. After that we hope to spend a week down the South Coast, and depending on how much money is left, come home or travel elsewhere. I don’t know if we’ll have Internet access at all on the way, but if we do we’ll try to blog about whatever we find in the archives,and anything interesting that comes out of family visits. 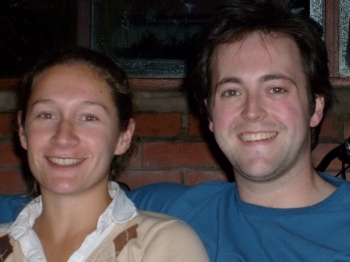 It’s over three years since we had a proper holiday; in May 2005 we went to Britain and had a good time meeting family members (some for the first time) and old friends, and visiting places where ancestors had lived. I blogged about the ancestral places on my LiveJournal. We won’t be going as far afield this time, but Val has been pretty busy at work, and is looking forward to a time of relaxing. Two months ago our dog Ariel had puppies, five of them, and by the time we get back they’ll probably all be gone. We’ll miss them, but they grow quite big, and we can’t afford to feed them all, so we hope they go to good homes. Two have gone already, but we are already getting very attached to them. 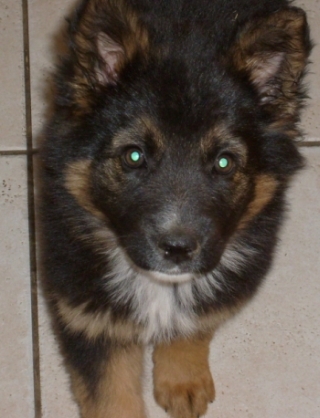 The mother, Ariel, is a cross German Shepherd and Border Collie, and the father, Samwise, is a German Shepherd, so the puppies have some characteristics of both breeds. The one in the picture we’ve nicknamed Allsorts, because she has all the colours of her ancestral breeds.